There is one women that has left quite a mark in my memory. Brookline just won’t be the same without Ethel Weiss. 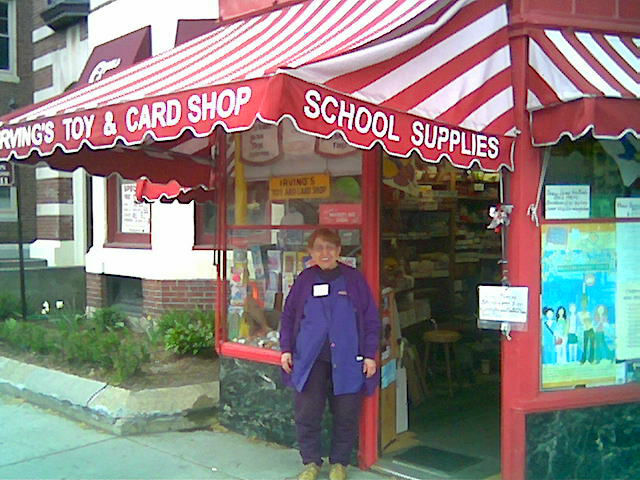 On so many hot summer days while taking a break from summer school I would escape to “Irving’s Toy Store”. It’s funny, when I was young I use to fantasize about running the very same store alongside her. One day 10 years ago I stopped in with my then three younger children to see if she remembered me. She surprise me and said that she did and even recalled my sister by name. That is the kind of person that makes Brookline what it is. I can’t even begin to imagine the whole that the sad loss of Ethel Weiss will have amid our town. I can’t fathom the idea of her store front missing from view. I only wish I had had the money to offer to buy her story so that her legend could continue. Maybe, just maybe her children will carry on in her name. BARNSTABLE, Mass. —Hyannis children from two families received gifts for Christmas, despite the actions of a real-life Grinch who literally stole Christmas from the children, police said. It all started when a Hyannis woman stole gifts intended for recipients of the Marine Corps Toys for Tots program, Barnstable police said. Unemployed, struggling single mother Candida Pina and another neighbor needed to pick up toys generously donated to them. “I asked my neighbor, if I gave her $10 would she give me a ride?” said Pina. The two women, with five children between them, told police that Janice Tully, 49, gave them a ride to pick up Christmas gifts for their children at Independence House in Barnstable on Christmas Eve. After putting about $500 in toys in the trunk of her car, Tully abruptly drove off without the women, police said. The women were then forced to take a taxi back to their homes. When Tully returned home, the two women confronted her and “She told them the toys were gone,” Barnstable police said, and gave them “several versions of where they” were. “We thought that Christmas was over, we honestly did. We thought that it was the end,” said Pina. When Barnstable police searched her car, most of the toys were gone and Tully, they said, refused to tell them where they were. “We are disgusted. We understand people are in need, but this woman wasn’t in need,” said Sgt. Michael Riley. Tully was charged with felony larceny and placed under arrest. But the five children still had gifts on Christmas. Barnstable police officer Brian Morrison found new toys from the Toys for Tots program and delivered them to the two families on Christmas Eve. “It was amazing. I just hugged him and the tears were rolling down my eyes,” said Pina. Tully was scheduled to be arraigned Thursday in Barnstable District Court. SOUTH PORTLAND, Maine —A stuffed puppy was reunited with its owner after being discovered at the Maine Mall. The owner’s mother picked up the puppy at Newbury Comics on Monday afternoon. The stuffed animal was taken to the store and held there until the owner could be found. The Scarborough Police Department assisted with the reunion by posting information and a photo on its Facebook page on Sunday.